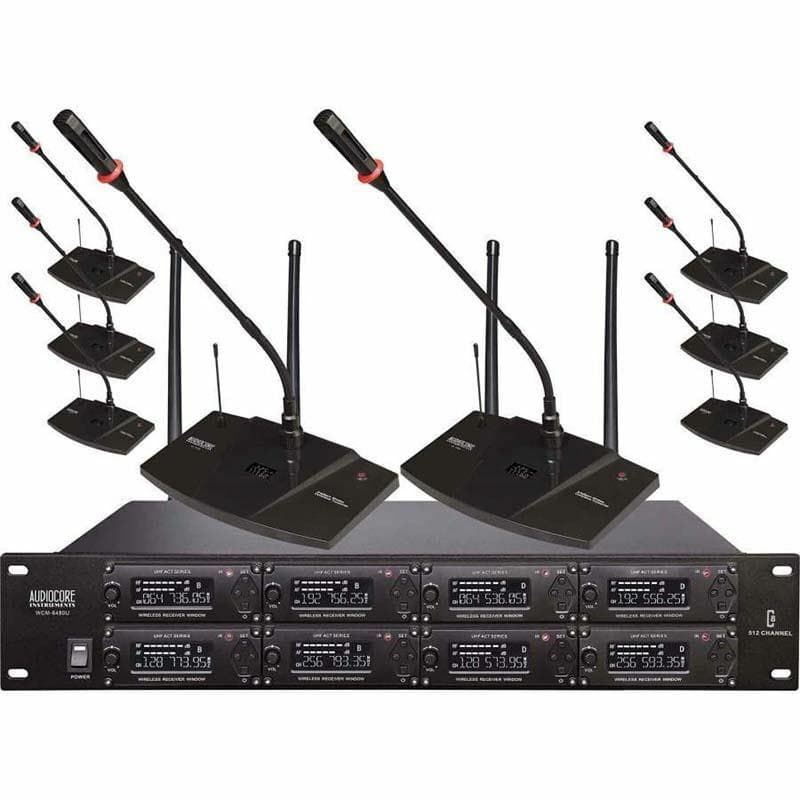 The Audiocore WCM-6480 is built using the latest technology for Wireless Conference System, with high end wireless modules and phase lock-up frequency to ensure the clarity of the signal and interference-free audio. This product is suitable to be used in large meeting venues or office meetings. It has a greater range and clarity than its sibling the Audiocore WCM-3280U. UHF international standard frequency range without interference, The WCM-6480U has a broad UHF frequency range of 500MHz-900MHz and has a 64 selectable frequency for each channel, up to 512 microphones in total can be used simultaneously in one system. Multi-adjusting frequency (several set can be used simultaneously up to 512 microphones). The WCM-6480U has a micro-processor control and phase-locked loop frequency synthesis technology. Multi-channel high quality sound surface wave filter with high quality anti-interference system. Equipped with LCD screen to monitor the working parameters, easy to read and user friendly. Equipped with adjusting knob in the receiver modules. Auto-mute and noise cancelling circuit, eliminating the noise when user turn the mic on or off. Using a reliable SMT production for high-end conference system. Built-in rechargeable lithium battery to save cost of having the need to change battery every now and then. Shure BLX24/SM58 Handheld Wireless SystemThe BLX24/SM58 Handheld Wireless System is part of the BLX wireless systems family.Shure BLX® Wireless Systems combine professional-quality sound with simple setup and an intuitive interface for legendary audio performance right out of the box. Precision-buil..